Air source heat pumps take advantage of a natural, environmentally friendly energy supply and help you to reduce household bills and cut home carbon emissions. Heat is extracted from the outside air and fed through to your central heating and hot water supply. By taking advantage of air heat pumps you can see a saving of close to £700 a year on your heating bills. Heat can be extracted from temperatures down to -15° C, so they’re suitable all year round and can even be used in the depths of winter. 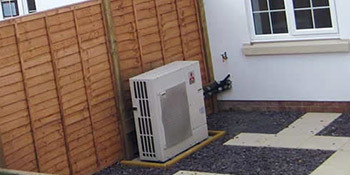 The air source heat pump cost will vary depending on the size of system you choose to have installed. Are air heat pumps suitable for my home? Air source heat pumps are suitable for most homes, but you should take a look at the checklist below to find out if they are right for your circumstances. Is there somewhere suitable the heat pump can be fitted? The unit, similar in size to a radiator will have to be installed on the external wall of your home. It will need a good air supply and a sunny wall would be ideal. Have you got a well-insulated home? What heating system will you use? Underfloor heating systems are proven to be more beneficial with air heat pumps, but they can in fact be integrated into any system. If you’re interested in renewable energy and want to reduce your bills, air source heat pumps could be the answer for you. You’ll be able to reduce your expenses by hundreds of pounds a year and cut your home’s carbon footprint. For up to four FREE quotes from air source heat pump installers, simply complete our quick form. Project: Need to speak with an engineer about possibilities for a new building supply and connection to old already with a ground sourced system. Project: Currently beginning work on a barn conversion so looking at heat sources, barn in approx 145.3 m2 ground floor, 65m2 first floor, therefore total flor ares 210.3 m2. Project: 1 air to air source heat pump, fitted in lounge on outside wall. EHS provided a summary in their quotation, not full cost data, but they had a useful proposal for ensuring that he system is exacly six, not slightly over-sized. The below data shows the energy performance of properties in Uk. Energy ratings vary from A to G, with A being the most energy efficient and G being the least efficient. The Energy Performance Certificate (EPC) rating factors heavily when attempting to sell your property, as possible buyers will see what amount they're probably going to be spending on their home heating expenses. Property improvements including insulation help to considerably improve a home's EPC rating. The information beneath illustrates the numerous types of homes in Uk. Essentially the most common houses throughout the UK are detached and semi-detached properties. Other kinds of houses include terraced houses, flats, converted flats and bungalows. The data beneath provides an indication for the number of households in Uk which are central heated and non-central heated. Households are heated by a range of sources which indicate how pricey annual energy bills will be. Types of central heating include gas, electricity, oil, solid fuel and LPG boilers. Changing exactly how your home is heated can easily see you with cheaper bills. The data underneath shows the spread of properties warmed by different fuels. Throughout the UK the most frequent by far and away are gas heated houses, followed by electricity and then oil. Biomass central heating boilers are also rising in popularity, heated by green products like wood pellets or agricultural waste.|Properties in Britain are heated by a number of fuels, including gas, electricity, oil, solid fuel and LPG boilers. Each fuel has a varying cost associated with it so you could find yourself with less expensive energy bills by changing how your house is heated. Even solar thermal panels are being considered by many people in order to reduce heating bills for the many years to come.